When planning an event, be it a wedding or corporate affair, the occasion needs to be just perfect. 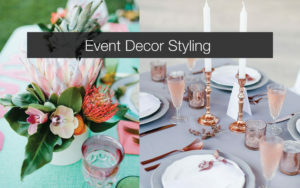 Deciding on your event or wedding theme, and using pinterest for inspiration is the perfect place to start. Once you have a vision of what your occasion needs to look like, we will transform your celebration into the perfect occasion. Our talented designers are available by appointment at our beautiful showroom in Muldersdrift, to design you the perfect affair. Out Trendy Settings are all inspired by our passion for what we do. Our Wedding Warehouse is where all our décor and rental furniture is kept. We boast a range of accolades when it comes to work we have done. If you are stuck with choosing a venue, let us assist. We work in and around Gauteng and Pretoria and after consulting with us, we will be able to recommend the perfect venue for your wedding or function. When it comes to your wedding, it is one of the most memorable days of your life and needs to be remembered as the most perfect occasion for ever. Our business is like a family based business, excepts it was started by two buds. We each have our own family and without our families support, we would not be able to deliver the perfect occasion for you. We understand how important your wedding is, and will provide you with a celebration in a professional and passionate manner. A visit to our showroom is well worth it. You will need to come with the knowledge that your initial idea may change once you have met with one of us. Our draping, lighting, décor, flowers and décor are all provided under one exclusive roof. We are considerate of your budget at the on-set of your journey with us and after being in business for 6 years with just over 2000 décor events behind us, we are so pleased to have our initial customers coming back for baby showers, friends kitchen teas and special occasion celebrations. Our other services include, wedding and event planning and coordination. Joc approvals. Catering. Cheese Tables. Draping and Lighting. Happy Snap photography. We have a few photobooths that add to your events fun elements creating an additional space for your guestst to have lasting memories of the perfect occasion. Our showroom is like a wedding emporium. We are with out a doubt one of the Best SA Wedding Décor specialists in this country. Our exclusive range of wedding décor is what sets us apart, besides our imaginations that stretch beyond limits, making us trend setters and market leaders. Event Inspirations celebrate events creatively. Do not hesitate to call us, for your next perfect occasion.